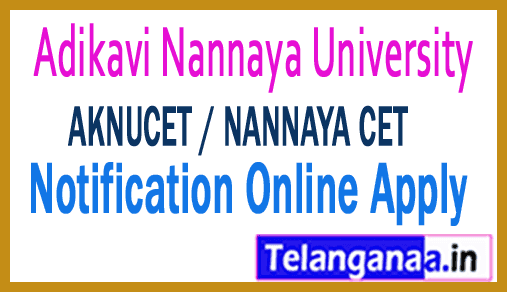 AKNUCET / NANNAYA CET 2019 @ www.aknudoa.in: Adikavi Nannaya University (DOA AKNU) has published PG Common Entrance Test Notification 2019. Many candidates are eagerly waiting for this notification. All required candidates can check and download from this page. Adikavi Nannaya University, Rajamahendravaram invites applications for admission to various PG courses offered by Campus Colleges and its affiliated colleges for the academic year 2019-20 through joint entrance tests (NANNAYA CET-2019). Candidates who are eligible and who are interested can submit online applications via (www.aknudoa.in or www.nannayauniversity.info). Application fee can be paid via credit / debit card / net banking. The detailed information can be found on the websites mentioned above. Candidates who have already passed their qualification examination or who have appeared for the final examination in 2019 are only entitled to NANNAYA CET-2019. Candidates who are qualified in advanced supplementary examinations of 2018 are also eligible. There is no age restriction for NANNAYACET (self-financing). However, the maximum admissible age for obtaining a fee / scholarship with respect to SC / ST and BC is 34 years and with respect to OC is 30 years. The candidates should download the Hall tickets from the University's website: www.aknudoa.in (or) www.nannayauniversity.info (or) www.aknu.edu.in and visit the exam. Applications should only be submitted online. For online submission, visit the website www.aknudoa.in (or) www.nannayauniversity.info (or) www.aknu.edu.in.